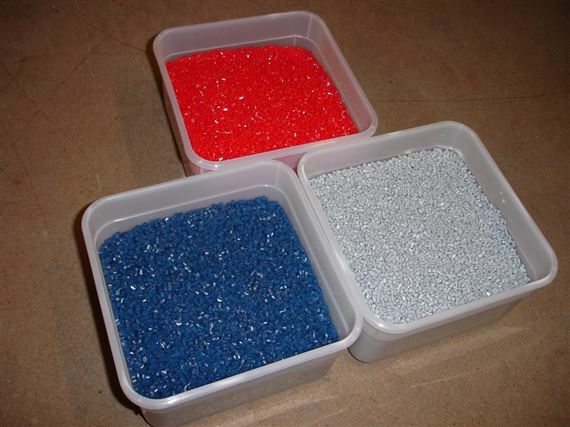 Polystyrene Granules (Red) - A material giving high gloss moldings but brittle moldings. This material can give off a limited amount of fumes if overheated, and should only be used in well ventilated areas. Polyethylene (Blue) - A low temperature material which is very easy to mold and gives a slightly flexible molding. Surface gloss is acceptable but not as good as Polystyrene. Polypropylene (Grey) - A good all-round material giving a tougher molding than polyethylene but without the brittleness of polystyrene. Surface finish is a matte sheen.